Everyone's always been friendly & helpful when we call to ask questions and/or book. Lovely property & just exactly what we were looking for on this particular visit, which was something close to the casino with a hot tub & easy access. This is 3rd or 4th cabin we've rented from Great Smokys & it's always been a good experience so it's the first website we check for availability when we're ready to come back to the area. Beautiful cabin and view. Enjoyed our visit. GSCR was very nice to work with for the rental. The team was always professional and prompt in responding to any questions. Booking time away has never been easier! Thanks GSCR, I've already recommended you to several people. Arrived at the cabin to find everything as expected and then some. Never before have I been able to go into relax mode so quickly. Everything was ready to go, all we had to do was unpack our groceries and RELAX! Thank you for a wonderful experience. We decided for a few extra dollars a night, over the cost of a hotel, to book a cabin. After many hours of searching I kept coming back to your website. It seemed more comprehensive and up to date, and easy to use. After my experience with your staff, a wonderful trip, and a beautiful cabin, my search will take MUCH less time for our return trip(s). Thank you! We have been coming to the area for 5 years now and this was by far one of the nicest cabins we have been in. Thank you. I am from El Salvador and even though I see mountains everyday, nothing as spectacular and majestic as the Smokey Mountains. While visiting my boyfriend from GA he surprised me with this trip as he knew I have always wanted to stay in a cabin in the mountains. HE couldn't have chosen any better. You cabin is simply amazing. I think that for the first 15 minutes of being in it all we could say was wow. We have stayed in awe every day. It is very comfortable and tastefully decorated. Of course the grand view you have is simply incredible. Thank you for giving us this opportunity to be a part of it. The team was great and made me feel very welcomed..I called to inquire about Milestone for my honeymoon, I was on the phone for about 5 mins before I knew I had made the right choice. Then after putting down the deposit, I experienced some credit card fraud a few months after and thought it would be a problem when I called to make sure I still had the cabin and once again it was great, friendly service. I just switched card numbers and went ahead and paid the remainder of my balance and just as explained..2 weeks before I was to arrive I received a pass code and directions that were awesome by the way, didn't get lost once and it was around midnight..
Amazing! The staff were very helpful over the phone when we were looking for our perfect honeymoon spot! They led us right to the spot that had just what we asked for! Perfect, beautiful, couldn't be better! The customer service was wonderful from the beginning. Very quick to respond and easy to work with. Members of your team were very kind, friendly, and helpful. Excellent stay. We were very happy with this house. 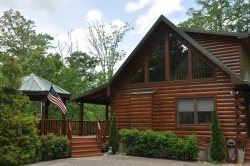 Great Smokys Cabin Rentals had choices that just fit our needs best. The location was good. They offered pet friendly rentals. Wanted to see the area more, including Joyce Kilmer Memorial Forest, Cade's Cove, and spend some time around Bryson City and Great Smoky Mountains National Park. Very helpful in every way! Greatly appreciate the directions provided by the staff because our GPS is worthless in the mountain area! Extremely pleased and loved the house we stayed in! Nice clean house at a great price. Easiest cabin rental experience I've ever had. The cabin was exactly as advertised, very clean, no problems at all. Will definitely stay again in the future. Your willingness to help me find a last minute cabin rental and the cost was good. The staff was great. The property was amazing. Very secluded and peaceful. We arrived about an hour before check-in. When we called to see if we could go in the cabin, the staff was very friendly and helpful. We loved the cabin. It was in a great location, clean and beautiful. The views were perfect. Everything was perfect at this cabin. We didn't find ourselves wanting anything else to make our vacation perfect. The deck area where the table and chairs are is so great. We sat out there almost all of the time. It offers comfort and great views. Also the hot tub. It was very new and clean and had a lot of jets. Perfect after hiking all day. Everyone I spoke with was great! The view from the loft was amazing at sunrise! The cabin looked great from the pictures! Always got right back to me if I had a question. Our family had a great time. This was the perfect home if you have a large family coming together. Met my expectations ! Please tell your housekeeper she did a great job! Your site was very user friendly. And you showed lots of photos. Everyone wants to see photos! Camped at Timberlake with family for many years. The kids were all grown up and thought it would be fun to get together. One of the reasons we picked this home was the open kitchen and the three living room couches. There was plenty of seating for everyone, and the kitchen was open so if it was your turn to cook, you did not miss out on anything! And then the fireplaces were lots of fun. We came to celebrate my husbands 30th Birthday. It 's been a refreshing stay. the weather has been perfect. Our cabin is delightful. Thank you. Thank you for the wonderful accommodations, the atmosphere, scenery, quietness that the cabin has to offer. The cabin was clean and relaxing, we will not forget. We hope to return soon! Spoke with Cathy on numerous ocaissions during the intial cabin selection process. She was absolutly great to work with. She gave us all of the information we needed and helped us pick the right cabin as we were looking at a couple of cabins in your rental group. We very much enjoyed staying in your lovely cabin! Very peaceful, and a great place to stay in comfort with friends. Love the view, loved the area, loved the well stocked and very clean cabin. Thank you for sharing, we will certainly consider staying here again if in this area. The fog in the mountains was beautiful!! Cabin was everything we hoped for.